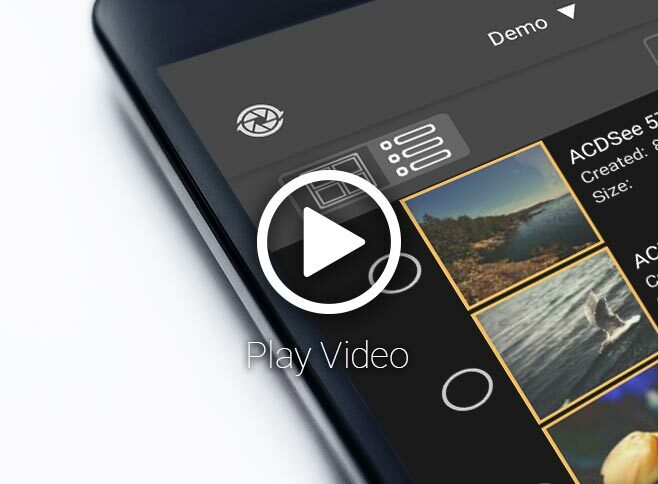 The ACDSee Mobile Sync app allows you to send photos and videos directly from your mobile device to ACDSee Photo Studio 2019. You can use ACDSee Mobile Sync to integrate your mobile content into your digital asset management and general photography workflow. Select and send, and your mobile media is immediately available for post processing in ACDSee Photo Studio. ACDSee Mobile Sync will keep track of which photos have been sent, and indicates new and unsent items using a colored border. With GPU-accelerated adjustment layers, RAW editing, and an arsenal of professional digital asset management tools, ACDSee Photo Studio Ultimate 2019 is perfectly positioned as the only software you need to satisfy any part of your digital photography workflow. As an established RAW editor and digital asset management solution, ACDSee Photo Studio Professional 2019 is brimming with everything you need to hold complete mastery over your photography workflow. Developed over decades, ACDSee Photo Studio Standard 2019 stands up to the demands of modern image processing. Photo Studio Standard 2019 continues to offer trusted, efficiency-driven digital asset management tools paired with photo editing essentials for the practical amateur. My server isn't showing up. Make sure your PC and mobile device are connected to the same local area network (with wired or wireless connections). Make sure you are logged in on your PC, and that it is not powered off or asleep. Right-click on ACDSee Commander and make sure that ACDSee Mobile Sync is not stopped. Try stopping and starting it again. Make sure that Bonjour is installed and not blocked by your Windows Firewall settings. Try quitting and restarting the ACDSee Mobile Sync app. Try disconnecting your mobile device from the network and reconnecting it. Try restarting your mobile device and PC. My transfer has timed out. Check your Windows Firewall settings and make sure that ACDSee Commander is able to pass through it. The pictures that I want to sync are not showing up in my Android ACDSee Mobile Sync app. In your Android ACDSee Mobile Sync app, use the Albums drop-down menu at the top center of your screen to browse to your folders. Choose Add/Remove Albums... from the drop-down menu to find all images on your mobile device. My files are being renamed automatically after I sync. Check the File Collision Handling setting and the Filenames setting in the ACDSee Mobile Sync app Settings section. Images on my PC are not showing up where I want them to. Check the Subfolder settings in the ACDSee Mobile Sync app Settings section. Check the Tools | Options | ACDSee Mobile Sync | Root Folder location in ACDSee Photo Studio. I am on a public network and I cannot find my server. Certain commercial public networks do not support Wi-Fi file transferring. After I reinstall ACDSee Photo Studio, my default target in my ACDSee Mobile Sync app is offline. In your ACDSee Mobile Sync app, go to Settings. Under Default Target, re-select your default target. When I pressed Send, more pictures were transferred than I expected. By default, any images that haven't been transferred yet will be transferred. You can counteract this by manually selecting the images you want to transfer. You can confirm the number of images that will be transferred by checking the number at the top of the Send dialog. I have several servers. How do I change the names of my servers? In ACDSee Photo Studio, go to Tools | Options | ACDSee Mobile Sync and enter new text in the Server Name field. How do I send pictures to multiple computers from my phone? ACDSee Mobile Sync currently does not support transferring to multiple computers in one session. You can manually send to multiple computers with multiple transfer sessions. I long-pressed the Send button, and ACDSee Mobile Sync sent the image to an undesired location. Make sure your Default Target is your desired location. The Default Target can be set from within the Settings section of the app.